These replacement auto tarps are designed to fit many different types of Roll Off Containment Tarp Systems. 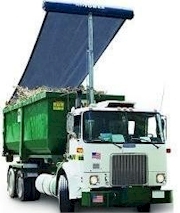 You will see some OEM Refuse replacement auto tarps & Universal replacement auto tarps. We manufacturer these Auto Tarps with durability and strength in mind. We carry these auto tarper replacement covers with as many or as little upgrades as you would like. This category contains Universal auto tarps that will fit most Rolloff Auto Tarp systems with Arms.